Fishponds is a suburb of Bristol, situated about three miles to the east of the town centre. It is bound to the north by the River Frome, beyond which lies the "village" of Stapleton, to the east by Downend and Staple Hill, to the south by Kingswood and Whitehall, and to the west by Eastville. Historically, it was a mining and quarrying area, with a significant amount of industry. The area's name come from two fish ponds, old quarry pits filled with water, which were present from at least the early 17th century (when they were called the New Pooles), but have long since been drained and built upon. In addition to being the location of industrial and trading activity, Fishponds plays host to two hospitals, one of which, at Blackberry Hill, began its life as a prison for French prisoners of war during the Napoleonic Wars. 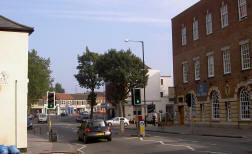 The St. Matthias campus of the University of the West of England is also situated in Fishponds, having started as a teacher training college in the late 19th century. 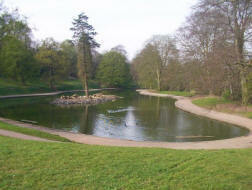 On Fishpond's northern edge, there are two large parks, Eastville Park in the west, and the Oldbury Court Estate (locally known as Vassals Park) to the east. Both parks border the River Frome, and they are connected by an attractive public footpath which runs alongside the river. On the river there are a number of wears, which used to drive water wheels for the mills situated alongside. 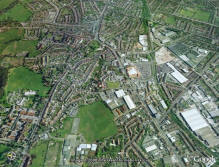 Most of the mills are now gone, although one, Snuff Mill (or, properly, Whitwood Mill), is still extant. 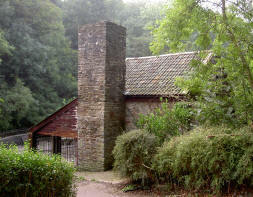 In the 1980s, the building was restored as a historical landmark by volunteers from the Bristol Industrial Archaeological Society and Messrs. Bartlett and Penny of the Fishponds Local History Society, latterly with help from an Avon County-run youth opportunities scheme. Text � Paul Johnson 1996. Website produced by Paul Johnson . Last updated 3 January 2011.